I'm not exactly over the moon about the way SE has implemented their decision to grant me the power to unilaterally close questions - but if history has taught me anything, it's that you can't fight City Hall (or indeed TPTB in general, and specifically those at SE). It's important to note that this new ability only applies to duplicate closevotes, and even then only if I have a gold badge for at least one the tags on the question. Since I see little chance they'll reconsider, and actually provide a reminder when my closevote is "supercharged", I suddenly find I need to pay more attention to my badge status. Currently my only relevant gold badge is for single-word-requests. But I've got a dozen silver badges for other categories - and so far as I know, any of those could become gold badges at any time. I know that Gold = Earned at least 1000 total score for at least 200 non-community wiki answers, and Silver = Earned at least 400 total score for at least 80 answers. What I don't know is how close I am to gaining more "question category" gold badges. So - is there an existing link I'm not aware of, or can anyone make one of those database queries that will tell me my total score and number of non-community wiki answers for any given tag? So that's 16 upvotes away from a gold word-choice badge, for example. 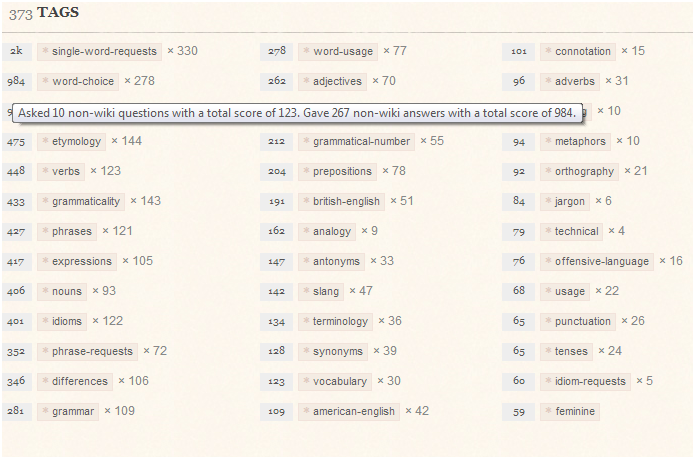 For meaning, it's 62, and for etymology you're missing 525 votes in addition to 75 more answers. And so on. You can actually extract an awful lot of information straight from the servers if you are willing and capable to fiddle a bit with SQL. There are many ready-made and saved queries that could answer these kind of questions in detail as well. Have a look at the data stackexchange. No gold badge after 10000 views? How to suggest that a closed question be migrated to another site?